DataSunrise allows to stay secure and protect sensitive data while moving database workloads to AWS. Amazon DynamoDB Monitoring by DataSunrise is a reliable tool for auditing and recording queries coming to the database and notifying of any potential threat. 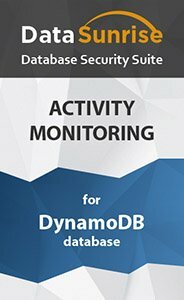 Database Activity Monitoring for Amazon DynamoDB is a database audit solution for an organization to take actions against insider threats and hacker attacks and assist in compliance with required laws and regulations. It performs 24/7 Amazon DynamoDB monitoring of all its activity and record it in logs. Flexible audit rule settings allow to alert an administrator about any unauthorized or unusual action: SQL injections, suspicious grant of privileges, alterations made, access to sensitive information., etc. DataSunrise deployment process involves learning rules setting. Having analyzed Amazon DynamoDB activity, the software starts to differentiate typical queries from unusual and potentially dangerous ones. The Amazon DynamoDB Activity Monitoring tool carefully keeps such data as information on user sessions, host names, IP addresses, application and user names, time and date of query execution, changes made by privileged users and administrators and so on. Integrated ability to send logged information to SIEM systems multiplies and amplifies Amazon DynamoDB Activity Monitoring operation. DataSunrise Amazon DynamoDB Monitoring is also an instrument to meet regulations that require implementation of database activity monitoring tools (e.g. HIPAA, PCI DSS, SOX, etc.) to investigate cybercrimes related to corporate databases. Amazon DynamoDB Activity Monitoring by DataSunrise is a comprehensive audit system mechanism with minimum influence on performance of client applications and a database itself.